Erin Hollaway Palmer is an editor, writer, and educator. She lives in Richmond, Virginia, where she is at work on a documentary, Make the Ground Talk. 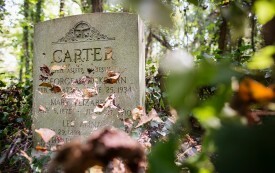 Photojournalist Brian Palmer documents the effort to restore a Virginia cemetery overtaken by trash and brush during years of official neglect.